An optional early drop-off is available for parents who need to start their day a bit earlier. Children arrive and settle in to one of the open centers. 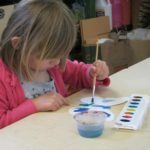 Quick activities are offered in the art studio. Our first group time always includes songs, movement, and dance. In addition, we plan for the upcoming day with discussion and calendar activities. 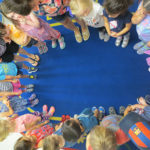 Center time is the main activity period that gives children a chance to work in many different group dynamics. 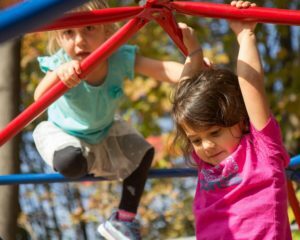 All centers are open and children may choose areas of play. 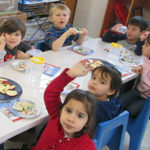 During this time the art teacher leads a project in the art studio, and at least one other teacher leads a small group activity for all children. Music, yoga, or woodworking enrichment programs are offered one day each week. A greenhouse located on the property is an important part of our curriculum, giving children a chance to learn about the natural world. The children regroup, sing songs, and prepare for snack. Snack is provided each day and includes a carbohydrate (such as crackers), fruit or vegetable, and drink (milk, juice, or water). BPS maintains a nut-free environment to accommodate children with severe food allergies. During this last group time a teacher reads a book to the children. The children are invited to recap their thoughts from our morning and they take turns sharing a special item from home. Large motor activities round off the morning with outdoor play. 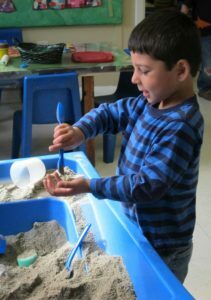 The children can choose to play on the climbing equipment, ride a vehicle, dig in the sandboxes, play in the pretend house, or perhaps be a caretaker in the greenhouse. 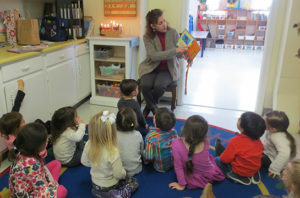 An optional, extended day program is offered to all preschool children. 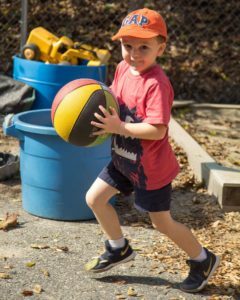 Additional activities often include cooperative games and more outdoor play.